USI, working with SEMTECH and STMicroeletronics, proudly announces this low cost, low power wide area network (LPWAN) wireless module that supports the LoRaWAN long range wireless protocol and AT-master command stack. This stand-alone compact module measures just 12 x 13 x 2 mm, a metal shielded package and utilizes the Semtech SX1272 ultra long range wireless transceiver and STMicro STM32L0 series ARM Cortex M0+ 32 bit microcontroller (MCU). This USI WM-SG-SM-42 module provides a variety of interface like LPUART, SPI, or I2C for peripherals. 3ch ADC and up to 20 GPIOs provide a plenty of flexibility for connecting sensors, switches and status LEDs, and the module is powered from a 2.0 to 3.6 VDC supply. 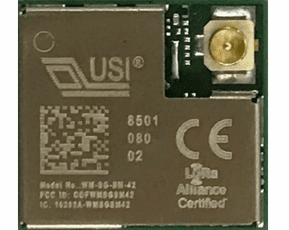 The USI WM-SG-SM-42 module has been certified under radio regulatory approvals for operating in the 868(CE) and 915(FCC) MHz industrial, scientific and medical (ISM) spectrum in most geographical regions of the world. The LoRaWAN certification makes it compatible with standard LoRaWAN Networks too.